Following the Full Simulation Exercise (FSIMEX) conducted in Rwanda at the beginning of January 2019 to assess EVD readiness/preparedness and response capacity in the country, an external Joint Monitoring Mission (JMM) team comprising of WHO specialists and partners relevant to the EVD preparedness efforts in Rwanda was deployed in the country. The Preparedness Joint Monitoring Mission gathered experts from WHO Regional Office for Africa (AFRO) and WHO Head Quarters in Geneva, Health Partners of the Rwandan Ministry of Health, WHO Country Office in Rwanda, RESOLVE, Donors notably from DIFID, USAID and CDC. The methodology implicated meeting with relevant stakeholders under the joint leadership of Rwandan authorities and WHO Country Office, reviewing the evaluation tool used, SOPs, protocols, communication such as posters, bulletins, progress reports and conducting visits to the different sites and high-risk districts. 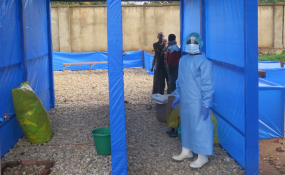 The overall target was to update the EVD consolidated preparedness key performance indicators (KPI) for all the nine technical pillars namely; risk communication and community engagement, surveillance, laboratory, case management, assessment of Ebola Treatment Centers (ETCs), Rapid Response Team (RTT), Point of Entries (POEs), Logistics and Vaccine. Risk Communication and Community Engagement activities are central. Consequently the Risk Communication and Community Engagement Technical Working group developed risk communications Standard Operating Procedures (SOPs) for EVD preparedness in the country. It was highly recommended to involve the Ministry of Information in the Technical Working Groups and the Emergency Operation Center (EOC). For standard communications like brochures in local languages as handouts, it was agreed that they should be available at Point of Entries (POEs), UNHCR transit centres, airports, other critical venues located in Rwanda. Rwanda being surrounded by other countries at risk and sharing borders with them there is an acute emergency to Enhance EVD surveillance at POEs which are vital as a result there was need to provide immediate access to equipment and supplies to the neighboring communities at transit and refugee camp settings to scale up timely case detection, reporting and investigation. Quarantine SOPs have also been developed for humanitarians crossing the borders. On Nov 30, 2018 the Rwanda Ebola Treatment Center (ETC) in Gisenyi was designated by the Rwanda Ministry of Health, WHO Country Office in Rwanda and CDC as ready to be opened but with limited sustainability due to limited number of trained competent human resources to manage the center. Gisenyi is a city in Rubavu District in Rwanda's Western Province. The city is contiguous with Goma, a large agglomeration across the border in the Democratic Republic of the Congo (DRC). Given the geographical position of Rwanda as landlocked country sharing borders with Uganda, Burundi, Tanzania and DRC, POEs were determined to be critical. Daily reports are now shared with clinic in charges at POEs clinic and Health Centers and the Ministry of Health. For vaccination there is an urgent need to scale up the roll out of vaccinations the frontline health workers to ensure protection of the Health Care Workers. The Preparedness Joint Monitoring Mission recommended that there was a critical need for more support for the Rwandan Refugee Transit Centers. A number of key preparedness measures will also have to be scaled up, not only at POEs, but also District Hospitals and Ebola Treatment Centers.